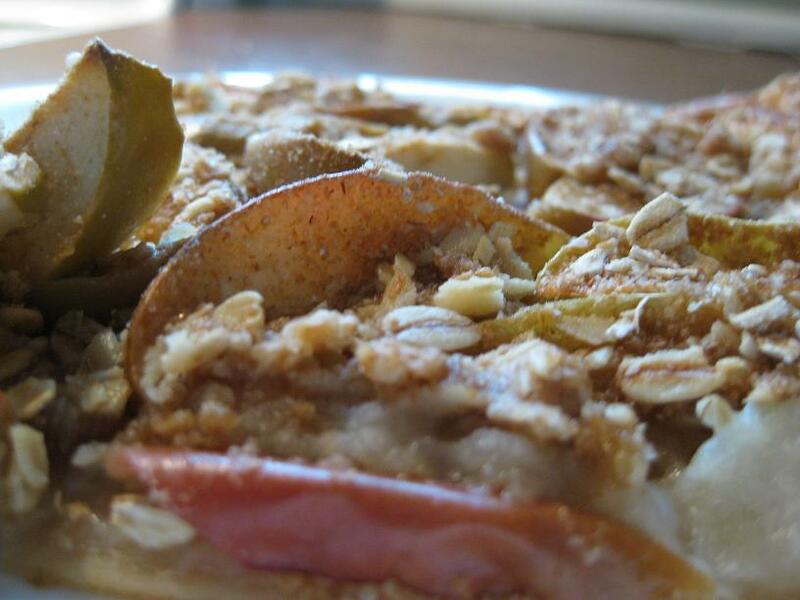 What to Eat Now: Apples! 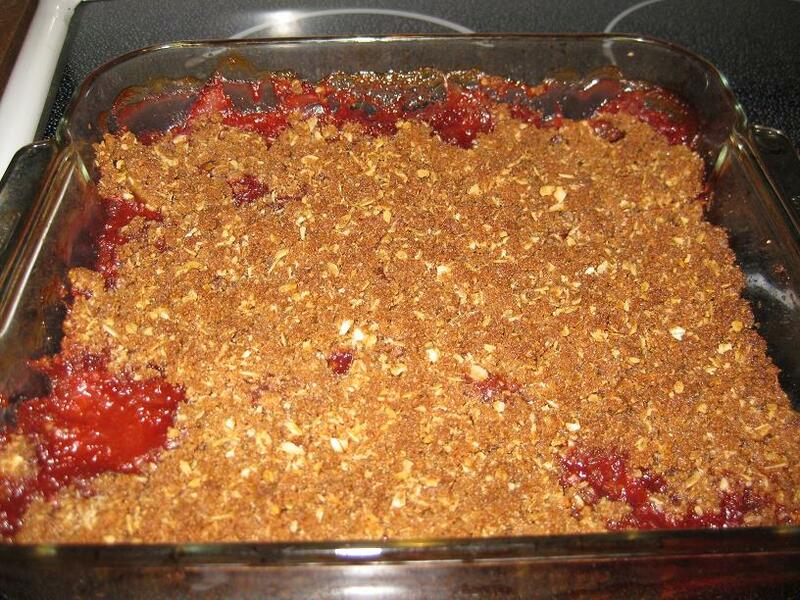 I’ve posted a couple of desserts with apples recently (Groundcherry-Apple Pie with Red Fife Crust and Strawberry Apple Crisp) but apples can be used for so much more than dessert. For last night’s dinner, we incorporated apples into sauce for pork chops as well as in the salad. I love fruit in salads! 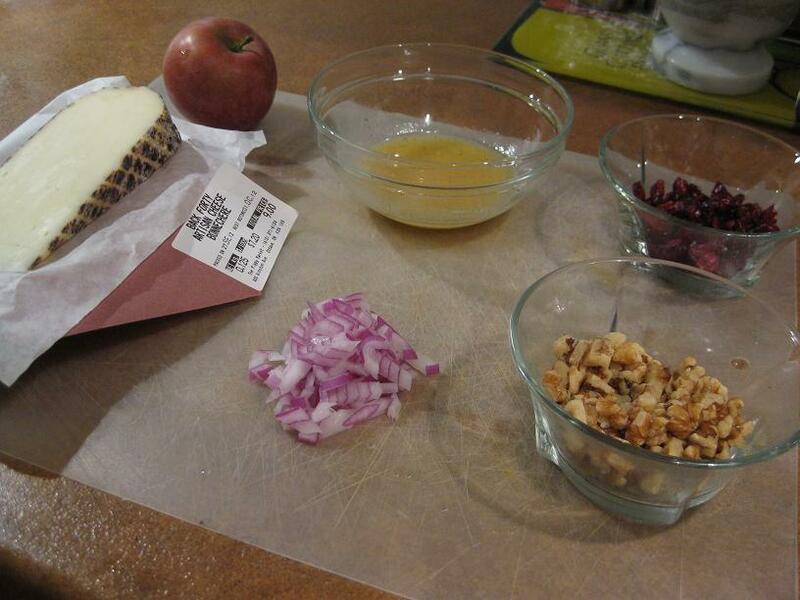 Fall is a great time of year to make salads heartier and play with unexpected ingredients – this one I topped with walnuts, dried cranberries and some amazing local cheese from Back Forty Artisan Cheese. 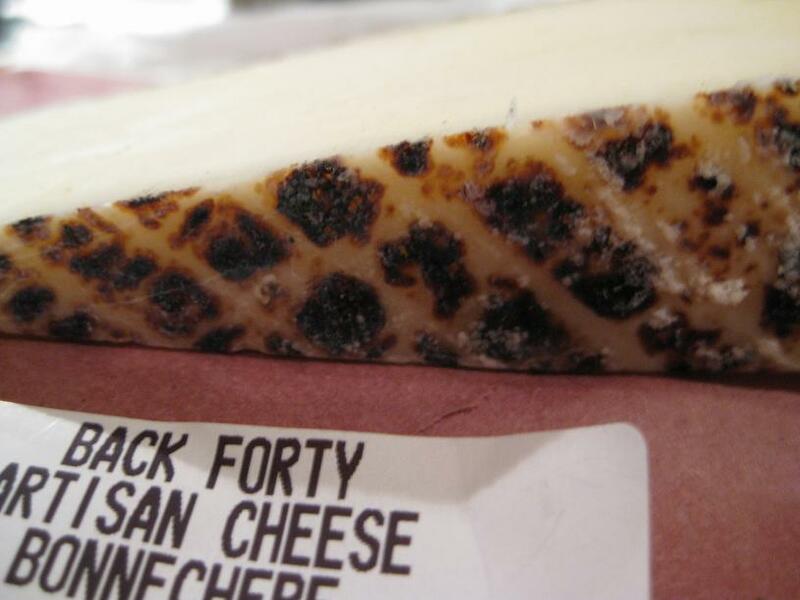 Their cheese is made by hand using heritage cheese making methods. 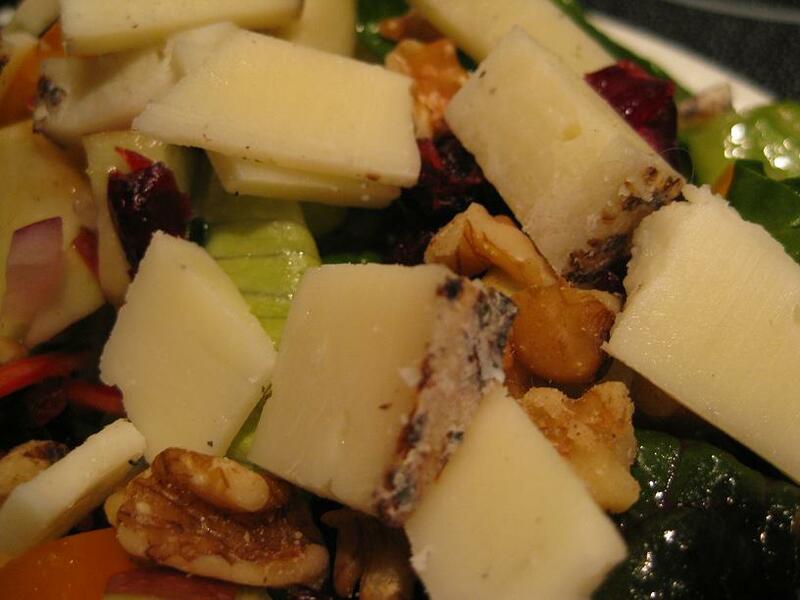 The one I used for this salad was called Bonnechere (love how they even used Ottawa Valley history to name the cheese!). It has a colourful rind, creamy texture and sightly smoky taste that I thought worked perfectly in this salad. Another trick I use for Fall salads is to mix different varieties of greens, including heartier greens generally reserved for cooking. Adding a couple of leaves of rainbow chard helps the body of the salad stand up to the more rugged toppings. 1. Heat broiler to high; set rack 4 inches from heat. In a large skillet, heat butter over medium-high. Add onions; cook, stirring occasionally, until browned, about 5 minutes. Cover pan; reduce heat to medium. Continue cooking until onions are soft, about 5 minutes more. 2. 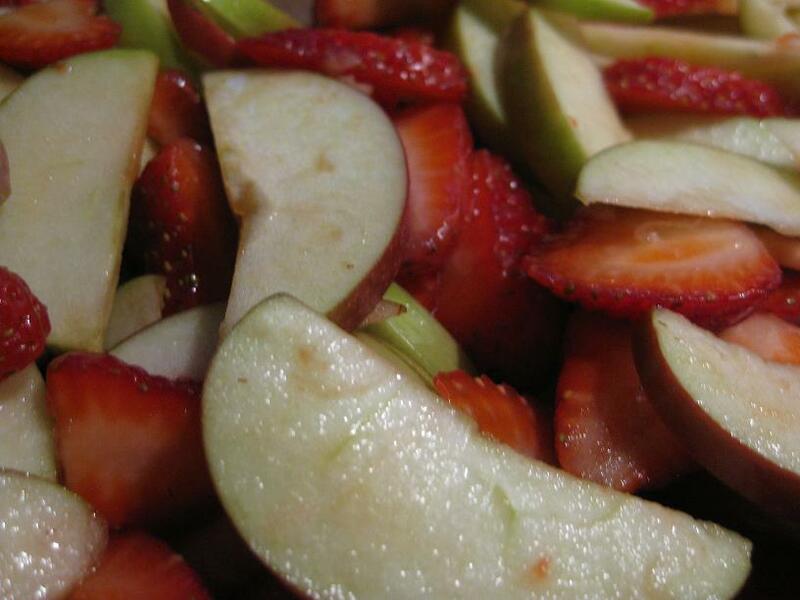 Add apples and wine; cover, and cook until apples are beginning to soften, about 5 minutes. 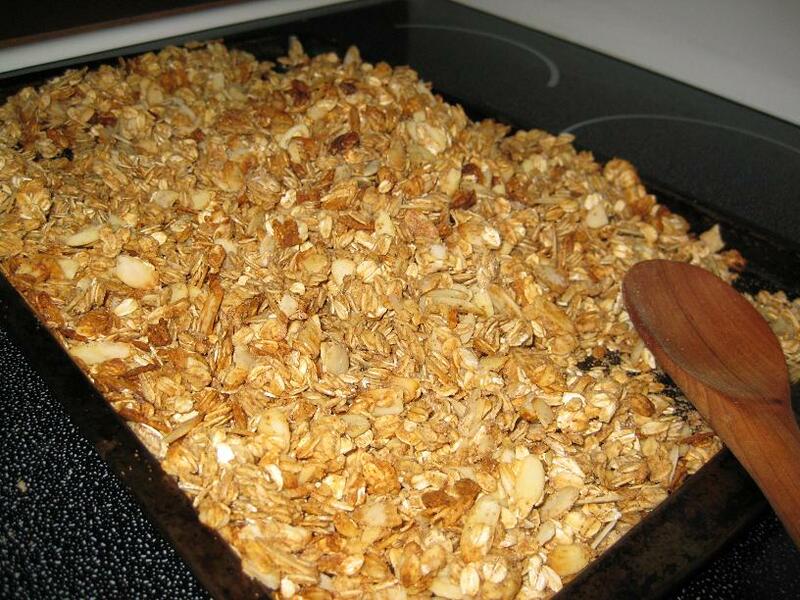 Uncover; cook, stirring, until most of the liquid has evaporated and apples are tender, 2 to 4 minutes more. Remove from heat; cover to keep warm. 3. 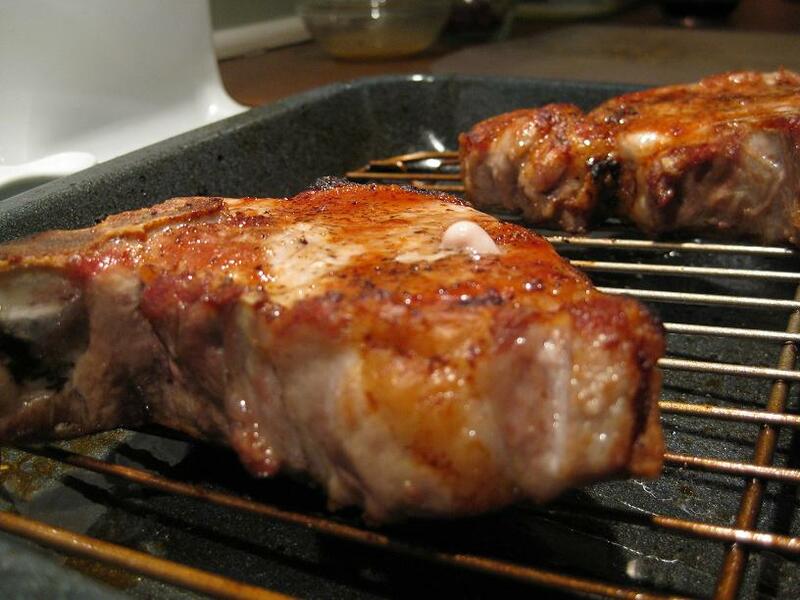 While apples are cooking, season pork chops generously with salt and pepper; place on a rimmed baking sheet. Broil until cooked through, 5-6 minutes per side (less if your chops are thinner). 1. Whisk olive oil, cider vinegar, maple syrup, mustard, salt and pepper in a small bowl. 2. Tear lettuce and chard into bite size pieces in large bowl. Add tomatoes, apple, onions. Pour in dressing and toss to combine. Pile salad on serving plates and top with walnuts, cranberries and crumbled/sliced local cheese. 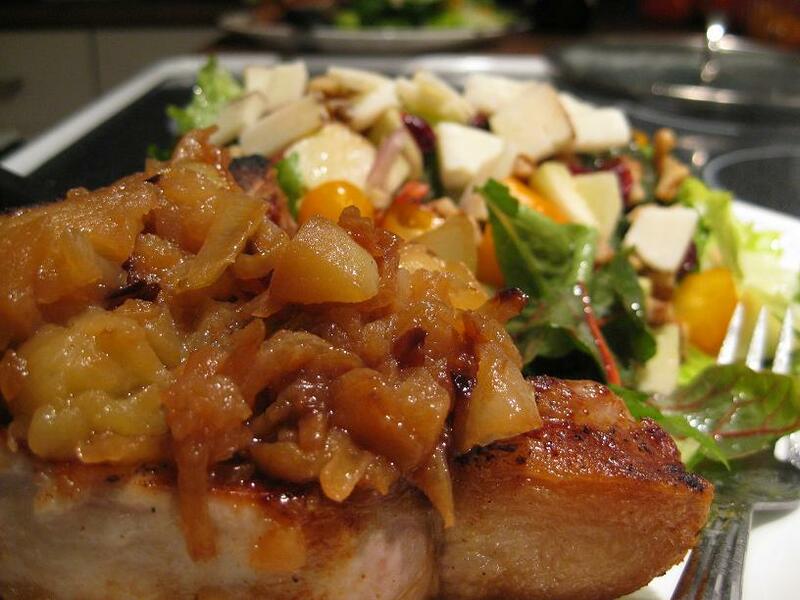 Spoon apple-onion mixture over pork chops. 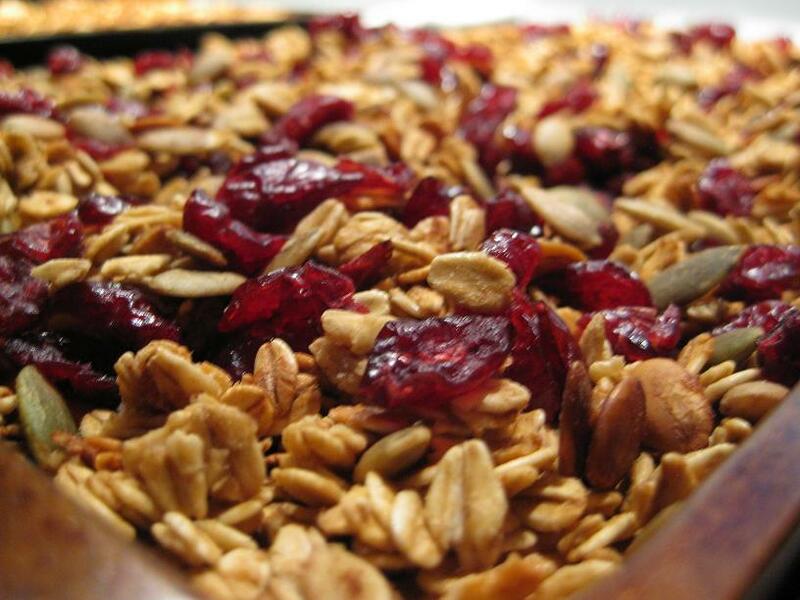 This pie is the perfect combination of two things I love – groundcherries and Red Fife wheat. 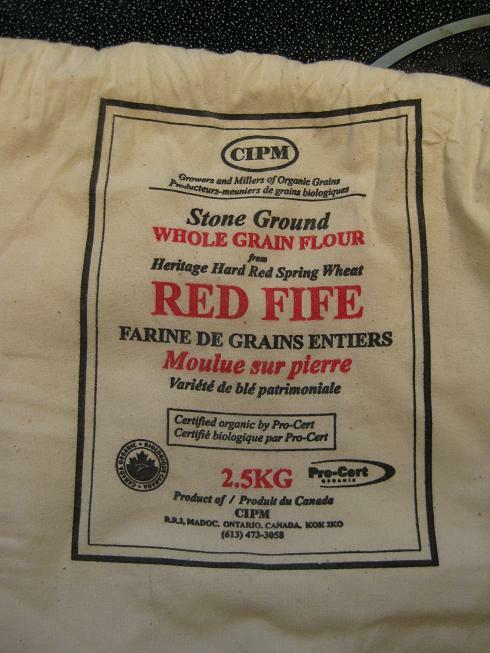 Red Fife is a heritage wheat, which is the grain equivalent to an heirloom tomato. Go here to read all about its awesome history and find out where to buy it in Ottawa. Did I mention that it comes in a neat cloth bag? Groundcherries are a recent discovery for me. 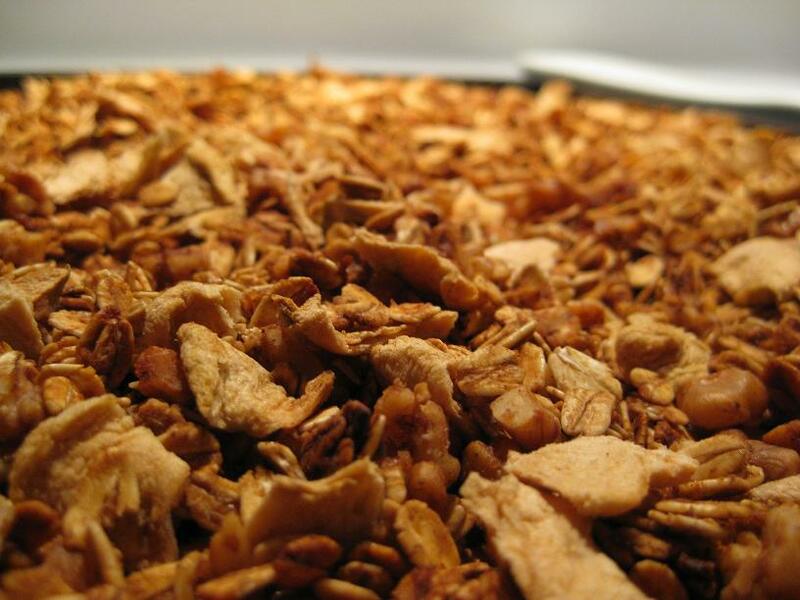 They`re a sweet member of the tomato family with a dry outer husk that you remove before eating. I had crossed paths with them a few times in the past, usually as a cute garnish on top of a rich dessert at a chmancy restaurant. But a couple of weeks ago we received some in our CSA so I had a find a more extensive use for them. A quick Google search came up with two options: pie or preserves. I didn`t have enough to make preserving worthwhile, so I went the pie route. I don`t have much experience with pie, but this was easily the most amazing pie I`ve ever made! It was incredibly delicious and I highly recommend baking one yourself. 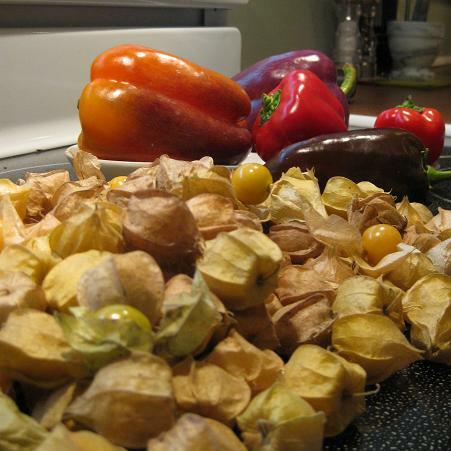 Groundcherries are still in season and I saw a couple of vendors at the Westboro farmer`s market selling them last week so buy some now before it`s too late! They keep in the fridge for a couple of weeks if you leave them in their husks. And look how cute they are, how can you resist? This recipe was inspired from here, here and here. 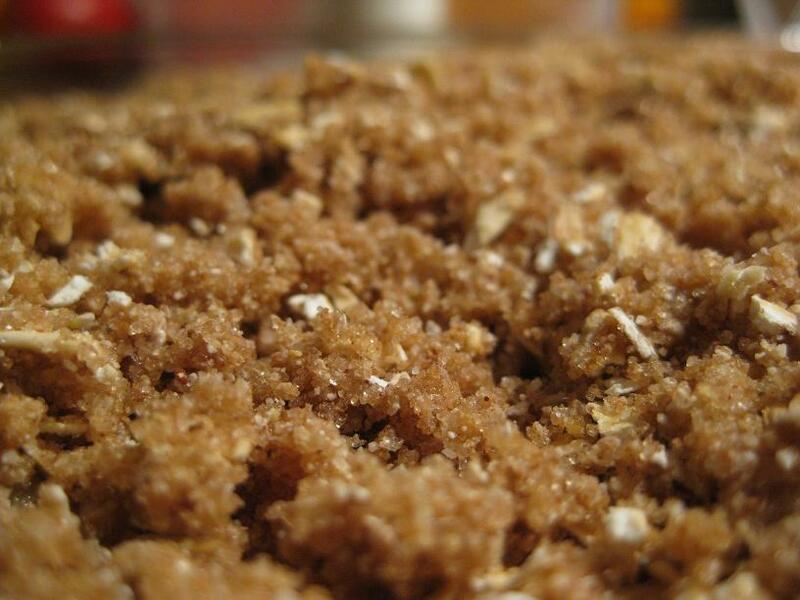 I relied on my food processor heavily – I used it to make the crust as well as the crumb topping. I was amazed at how much time this saved! 1. Place all ingredients except water in food processor and process until butter is evenly cut into flour (about 20 seconds). 2. With processor on, add water and continue processing until the dough forms a ball (about 20-30 seconds). 3. Remove dough and chill at least 1/2 hour before using (this makes it easier to roll out the crust). 4. Roll out dough and place in pie pan. If your dough has “personality” like mine does (i.e. holes, cracks, etc.) don’t despair, just use pieces from the edge to patch it up and it will turn out fine. Add a tiny bit of water to make it stick, if necessary. Cut off any dough that hangs over the edge of the pie plate. 1. In food processor combine all ingredients except butter. Process until combined. 2. Add butter and continue processing until mixture forms crumb texture. 2. Wash groundcherries and apples. Dice apples to about the size of the groundcherries. I leave the peels on, but you can peel them first if you like. 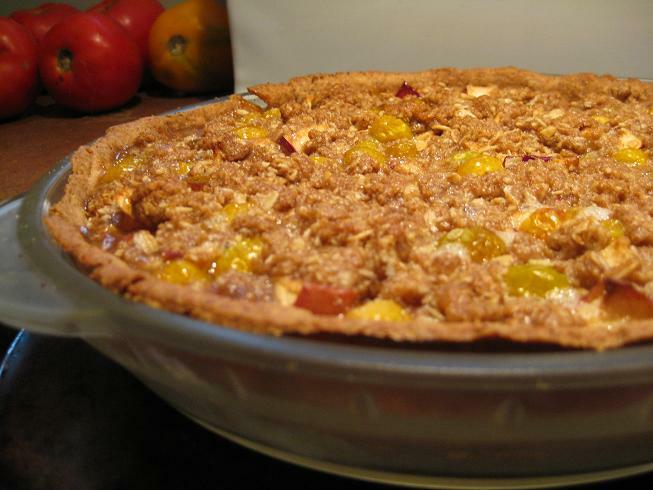 Mix apples and ground cherries and place on pie crust. 3. Mix brown sugar and flour and sprinkle over groundcherries/apples. Sprinkle water over top. 4. Sprinkle crumb topping over pie. 5. Bake in preheated oven for 15 minutes. Reduce temperature to 375 and continue to bake for 25-30 minutes. The filling should be bubbling and the crust browned on the edges. 6. Remove from oven and let cool at least 1/2 an hour before serving. I love how the groundcherries peak through the crust! Enjoy!